The 8-Port Dual Link DVI KVMP Switch with VGA Support from Iogear is a control unit that allows access and control of up to eight computers from a single USB keyboard, USB mouse and a DVI/VGA monitor console. It can be cascaded to three levels, allowing up to 73 DVI KVMP switches to control up to 512 computers, all from the original single console. Additionally, the switch comes with Iogear's Video DynaSync technology to optimize the display resolution. The DynaSync* technology reads and remembers the monitor's parameters (EDID) so there is no delay or change of video resolution when switching between or booting computers. Switching between computers can be easily accomplished either by manually pressing the front panel push buttons, entering hotkey combinations from the keyboard or via the on-screen display (OSD) system. A convenient Auto Scan feature permits automatic scanning and monitoring of activities on all connected computers. 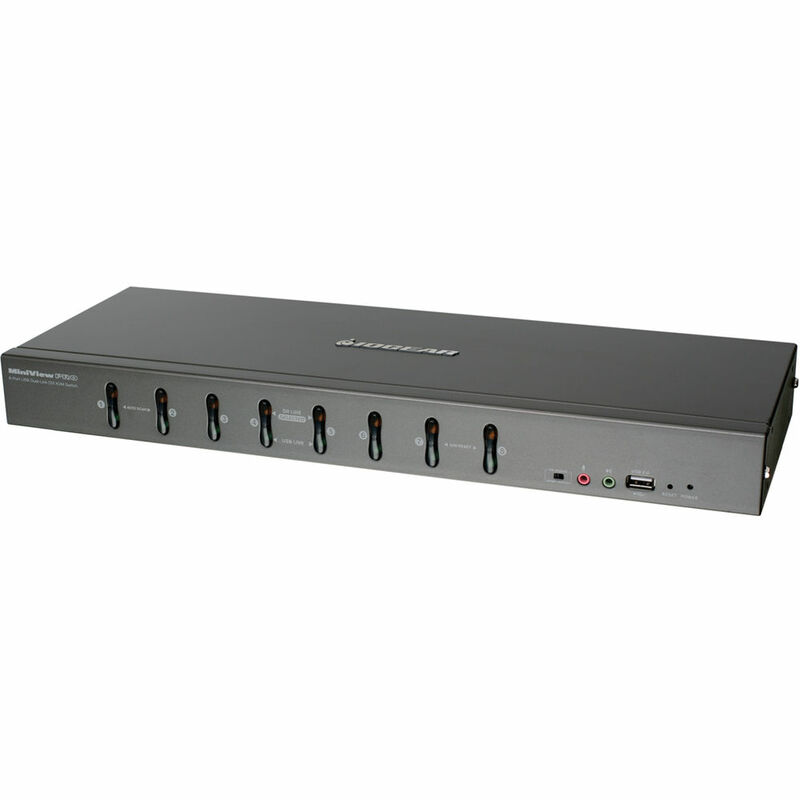 The DVI KVMP Switch provides 2.1 stereo audio and microphone support as well as multimedia keyboard support. Note: *DynaSync technology provides EDID support for Windows 7. *The DynaSync technology provides EDID support for Windows 7. *PC keyboard combinations emulate Mac / Sun Solaris keyboards; does not emulate Mac / Sun Solaris keyboard to PC keyboard. Box Dimensions (LxWxH) 21.9 x 9.8 x 6.1"